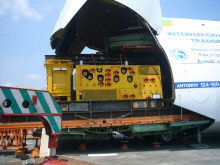 Yrii was right – and he won his bet against the entire Antonov loading crew. On the fourth loading attempt everything finally came into place and gone were the worry lines in the faces of everyone involved: The Christmas tree for the Caribbean was correctly positioned inside the aircraft. It had been inched past the most critical section right under the cockpit of the An-124, where the maximum vertical clearance is 4400 mm. Every single one of these millimeters was needed. Mind you, the word “difficult” probably does not do justice to this mission, which was not yet over. Antonov said afterwards, that it was their second most challenging air charter from a technical perspective. 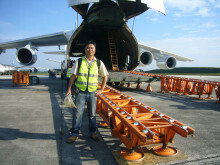 For Willi, too, it turned out to be the most complex air freight related assignment of his 27-year career with Panalpina. As Panalpina’s global head of transport engineering for Energy and Project Solutions, he had been overseeing everything in Malaysia and working hand in hand with teammate and transport engineer Edward Wong, who headed the operation. The preceding five days had really put both men to the test. Moving a Christmas tree from one end of the world to the other may not seem like a particularly big deal, but when the tree in question is actually a subsea “Christmas” tree, used in offshore oil and gas fields, weighing in at 76 tons and measuring 6360x5000x4050 mm (L,W,H), it is not your average delivery. Subsea trees – also called Christmas trees because the devices can sometimes resemble a tree with decorations – are a complex configuration of valves and sensors installed on a wellhead on the seabed to monitor and control the flow of hydrocarbons. The challenge with this particular subsea tree for one of Panalpina’s oil and gas customers was that it was one of the largest and heaviest ever built, requiring a special frame for the transport by air. However, measurements two weeks before the planned loading showed that the steel main frame consisting of 930 individual parts and weighing 28.6 tons had deflected. “When we first inspected the main frame, we realized that because of this deflection, the entire package to be loaded into the aircraft would end up being higher than was planned during the design stage,” recalls Edward, Panalpina’s regional head of transport engineering for Asia Pacific. An already close call in terms of clearance inside the aircraft just got even closer. It was decided a load and stress test of the main frame would be made at the fabrication yard, which resulted in a ballast weighing 76 tons being placed on the frame. 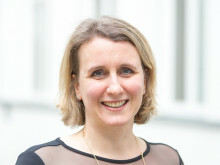 “We had only very limited possibilities at the time to perform such a load test, but the method used and results obtained were satisfactory and the green light to proceed with final preparations was given,” says Willi. During the night, the main frame was transported to the plant where the subsea tree had been manufactured. On March 12, 2016, the Christmas tree was loaded onto the main frame which sat on a trailer. Using conventional tools such as a tape measure and water level, the height of the entire cargo was then measured and determined at 4366 mm. 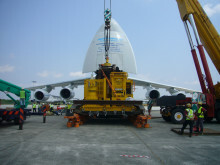 This would, in theory, leave enough room to slide the cargo through the nose opening of the An-124 and past the cockpit section on the aircraft’s skidding system, with 17 mm to spare at the top and 17 mm at the bottom. However, the first loading attempt on March 13 did not succeed. The cargo could not pass under the cockpit section. A second attempt also failed and the mission was put on hold. 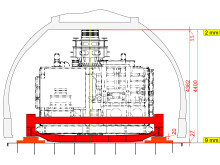 Additional deflection and torsion of the main frame had occurred during the skidding operation and it became obvious that modifications to the frame were needed. 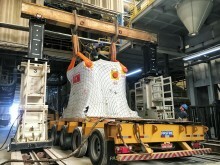 It was thus decided to take the cargo back to the subsea tree’s fabrication plant in Johor. What followed were highly technical discussions between Panalpina’s transport engineers, the customer, Antonov and the two companies that had produced the subsea tree and the frame. Over the course of five days, all parties involved worked tirelessly to make modifications to the frame and even the subsea tree. Loading was attempted for the third time on March 18, but failed again. 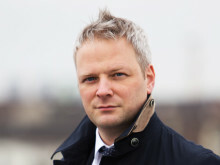 “Luckily it failed by a big margin,” says Edward. 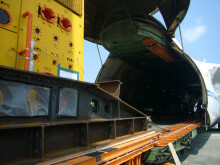 “This indicated to Yrii that something had to be wrong with the set-up of the Antonov’s external loading ramp.” The cargo was removed once again from the ramp in order to make adjustments. Finally, on the fourth attempt, loading succeeded. Inching ever closer to the aircraft’s main hold, the subsea tree slowly passed through the cockpit section. At this stage, the clearance between the aircraft ceiling and the top of the cargo was 2 mm, and between the base of the main frame and the aircraft floor just 9 mm. It meant that during the skidding operation another 27 mm of clearance were lost to deflection and other factors. “In my entire career I’ve never seen anything this tight in an aircraft,” reflects Willi. When the Antonov finally took off, destined for Trinidad and Tobago, everyone was greatly relieved – and Yrii Rudko was a happy loadmaster. He had said all along the cargo would fit in eventually. But being a true sportsman, he did not rub it in afterwards. A wise decision perhaps, since the journey ahead was long. 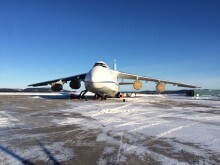 Before the aircraft reached the tropical heat of its final destination, ten tech stops had to be completed by the Antonov crew – and Panalpina in Canada had to scramble to help organize a heater in the middle of a winter storm. Read part II of the story on December 21, 2016.